Chickpeas, feta, parsley and a few more key ingredients will keep you coming back for more when you make this simple salad! This simple dish blew me away! It has so many flavors that all blend well. I was very happy with how this turned out. I’ve been experimenting lately with bean salads. I love chickpeas (aka garbanzo beans), so I knew making up a salad with chickpeas as the base was something I HAD to try. Since chickpeas are used to make hummus I went with flavors that reminded me of hummus and Mediterranean foods. I tried to go for a filling, comfort food, yet fresh type of taste. Sauteing up the onion and garlic give the dish a deeper flavor, supported by the cheese. The parsley and fresh lemon juice give it the fresh taste! 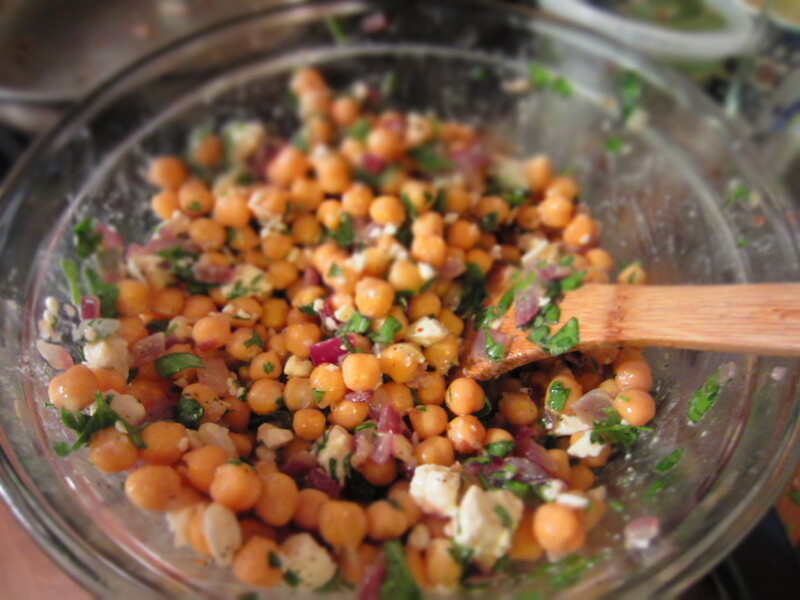 The chickpeas do their job of supporting flavors and filling you up when you eat it! This is a great side dish to make for pretty much any occasion. I like to make it the night before I am going to serve it because if you let the salad sit those flavors are REALLY going to blend and make an impression on your taste buds!